DP1.2-Vision uses CAT-x cables or fibre optics to transmit signals up to 140 m (CAT) or up to 10,000 m (Fiber). The devices use DisplayPort 1.2 video and are available as single and multi channel variant (in preparation). 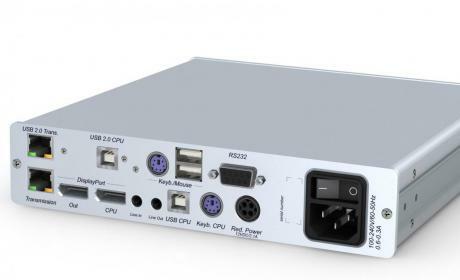 It is also possible to transmit transparent USB 2.0, RS232 and audio signals. If the console module loses the video signal due to a broken connection or a problem with the computer's graphics card, the Screen-Freeze function "freezes" the last displayed image of the monitor. This state is highlighted by a red semi-transparent frame. The function is automatically cancelled when an active video signal exists again.